Theft can be a major concern on college campuses; according to U.S. Department of Education, there were about 40,000 thefts in 2006. And campus fires are on the rise with a dramatic increase from a low of 1,800 fires in 1998 to 3,300 fires in 2005, according to the Consumer Product Safety Commission (CPSC). For students who live in a dorm, most personal possessions are covered under their parents’ homeowners or renters insurance policies. However, some home insurance policies may limit the amount of insurance for off-premises belongings to 10 percent of the total amount of coverage for personal possessions. This means that if the parents have $70,000 worth of insurance for their belongings, only $7,000 would be applicable to possessions in the dorm. Not all insurers impose this type of limit, so you should check with your agent or insurance company representative. Expensive computer and electronic equipment and items such as jewelry may also be subject to coverage limits under a standard homeowners policy. If the limits are too low, parents may consider buying a special personal property floater or an endorsement for these items. There are also stand-alone insurance policies for computers and cell phones. 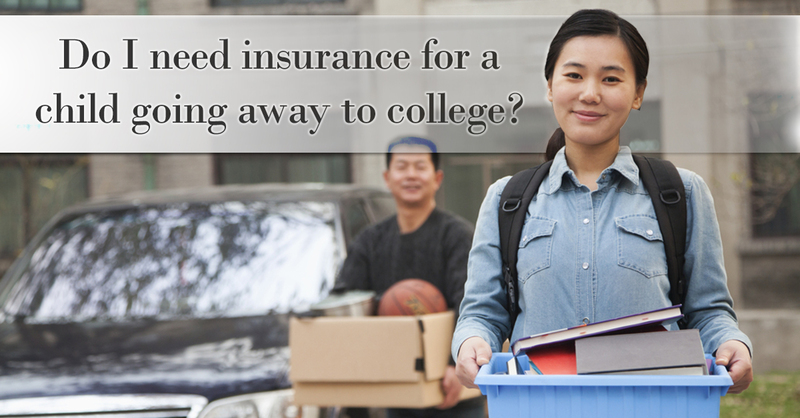 The following is adapted from the article, “Do I need insurance for a child going away to college?.” For more information please visit www.iii.org.